As you gear up for your child’s spring sports season, it’s important to know how to protect them against injuries. This is especially true if they play contact sports. But really, any sport that involves other players and some type of ball, bat, or stick can put their smile at risk. It doesn’t take much to damage a tooth or injure gum tissue, not to mention knock their jaw out of alignment. That’s why you should only trust our team at Times Square Dental to protect your child from potential harm that sports pose for their smile. Whether your child plays contact sports or just likes to stay active, a custom athletic mouthguard from the dentist office is the best way to prevent damage to their teeth, lips, and gums. The better fit from a professional will also help prevent avoidable trauma from blunt force to the head, jaw, or face. Here are some common reasons you should only trust your active child’s smile to the professionals at Times Square Dental. If your child’s mouthguard is moving around or too big, it will make it hard for them to breathe easily, especially during rigorous exercise. 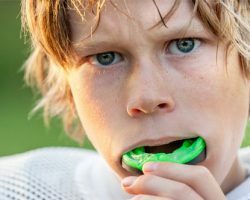 Relying on a boil and bite mouthguard from a store not only means less protection, but it could hinder your child’s ability to stay focused on the game. Our dentists can take precise impressions for a perfectly crafted mouthguard that while help your child maintain easy breathing and keep their head in the game! Going to the sporting goods store nearby for a universally-made mouthguard may seem like a good idea at first, but all it takes is one injury to experience buyer’s remorse! Saving money on the front end with a cheap, mass-produced mouthguard could shift around while your child wears it. If they take a ball, puck, or elbow to the mouth, any teeth and gums left exposed are susceptible to injury. A broken, loose, or knocked out tooth will require some sort of restorative treatment that will turn out to be more expensive than a custom mouthguard. For that reason, you can’t be sure that an ineffective, poorly-fitting guard will save you any money in the long run. Parents understand how picky kids can be when it comes to wearing something they think is uncomfortable. It’s a waste of money to buy something they won’t wear. It’s true for clothing, and it’s true for any kind of athletic gear. You know that if a mouthguard fits them properly, they’re more likely to wear it as they should. That’s why it’s a smarter investment to get one from a dentist who can make sure it’s customized and comfortable. After all, a mouthguard offers little protection when it stays in a gym bag. You invest a lot in your child’s athletic experience. Youth sports has become far more intense and competitive in recent years, so it’s more important than ever to make sure they have what they need to succeed. An athletic mouthguard should be part of that equation. With a comfortable fit and needed protection, your child can stay focused on the game while keeping their teeth safe from potentially hazardous injuries. Let Dr. Hastings or Dr. Dial fit your child athlete for a mouthguard before the season really take off! Call our Boise, ID dental office today at 208-278-1069 or feel free to reach out online to request an appointment.